Top 10 free Photo collage softwares and Tools: – Creating collages is really fun- on paper as well as on the internet. These days the internet offers varying types of software created especially for making a virtual collage- it’s easy and neat without the hassle of glue and paper coming in between- and a lot of collage software is available completely free of cost. Moreover, since most people nowadays prefer keeping digital copies of photographs and pictures as opposed to printing them out, creating a collage on the computer has become a great way to save pictures. One can also make a virtual collage and send it to another as a gift, as most collage creating software enable sharing via e-mail or social media. Since creating collages is so cool and has so many benefits, we’ve come up with this list of top 10 collage making software, just for you to choose from. Users have appreciated Fotor’s classic UI with the charcoal backdrop that makes every type of picture stand out beautifully. 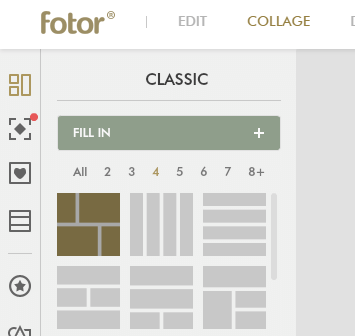 Fotor allows the user to put up to thirty images together, mix and edit them and create collages with them using the many editing tools offered or any of the sixty effects Fotor provides. From cropping to zooming in and out, editing pictures is fast and simple on Fotor, and creating a collage is a smooth process without any sort of disruption in performance or any lags. Navigation is a major plus point of this software. However, users have also complained of paucity in Undo/Redo options, especially after a filter or multiple filters have been used. The software’s constant requests for admin permission to run the software’s Chinese publisher have further hindered the growth of trust consumers have on Fotor. Photovisi is an online collage maker that provides the user with a wide variety of colorful and unique templates to choose from in order to make their collage. The user, after choosing a template, can go ahead and upload their pictures to the site. The collage will be automatically created and the user can then proceed to edit, replace or delete any picture in the collage. Side by side, bulletin form, sequences and random picture arrangement are some types of templates offered. Colours are vibrant and the process is easy and user-friendly. The user can download the collage after creating and editing it, and can even forward it to others via e-mail. Coming to the cons, a lot of people do not prefer this collage maker as they don’t want to upload personal pictures online- they feel it is a cause of concern for security. However this is not a very valid concern, as our pictures, when uploaded to our computer systems may be accessible in other ways, and the media we e-mail to our friends and acquaintances also remain somewhere in the recesses of the cyber world even after, say, said email has been deleted. A collage maker cannot do more harm than using the internet itself for that matter. A more valid reason many people have rejected PhotoVisi is because of the simple fact that this collage maker is online. If you don’t have access to the internet, you will not be able to create a collage. If you lose internet connectivity for some reason after creating the collage, you will be unable to download it to your system or send it to anyone. Considering that most other collage software is offline, this gives Photovisi a major thumb down. A very basic collage making software, this one performs exactly as it professes to. CollageMaker comes with a large number of options, all of which are quite elementary, such as cropping, resizing, but it offers nothing more advanced in its trial version. The trial version, in this case, is a benefit for beginner users who just want to get an idea of basic image editing and collage creation on the simplest level possible. Since it is so basic, beginner users will like to move on to better, more advanced software after trying CollageMaker, and since it is so easy to understand, no beginner will have any trouble learning to make collages with it. CollageMaker does not allow you to crop outside a basic structure and selecting images can often be a long step by step procedure. All in all, CollageMaker is worth a try, but easy to move on from, and according to many users, not really worth paying the price for the full version. A lesser known but completely safe alternative to the highly popular PicMonkey, iPiccy is free of cost and provides collage creating tools as efficient and excellent as PicMonkey’s paid premium version. 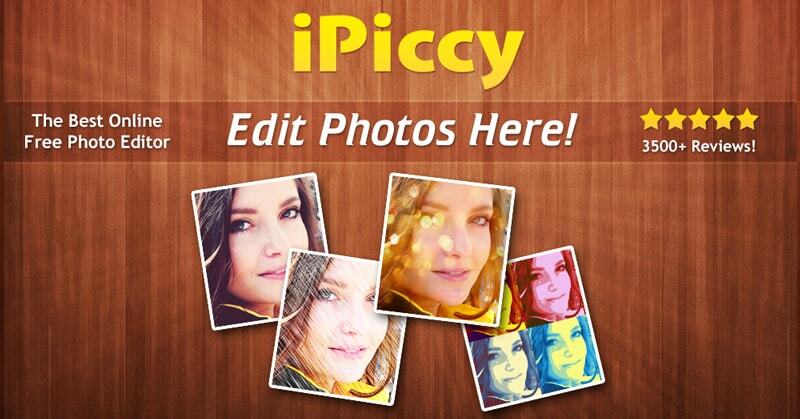 With more than 120 picture effects, high-speed performance and easy navigation, iPiccy is indeed worth a try. It is, however, an online collage maker just like Photovisi, so you can’t create a collage using iPiccy if you’re not connected to the internet. Though that is a disadvantage, the large number of editing tools and effects offered by the software make up for iPiccy being available only online. Besides that, iPiccy supports a large number of image file types and offers photo effects such as those provided by Photoshop and other editing software. Not a lot of people know about this software, and there aren’t many sites with user reviews for iPiccy, which could be a reason why it is not more popular. 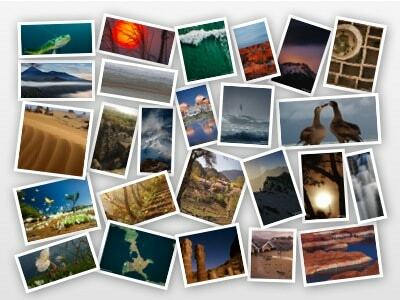 This free software has been created expressly for making collages. Creating collages using Collagerator is very easy, all you have to do is select images; put them in a template and go on to customize the details. You can export the created collage in a wide variety of image files, and you can even decide what form you want it printed in, for example, a postcard, or greeting card, etc. The layout for this software is very basic and pleasant to use. Major lags in performance are yet to be reported, but users have complained that the software does not come with an inbuilt image editor separate from the collage creator, and since a lot of people like to have image editors combined with collage makers in one software, this is a con for Collagerator. 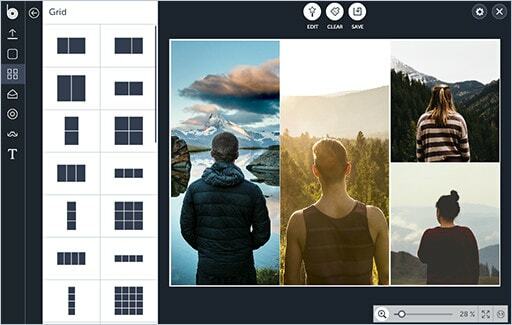 CollageIt comes in a very clean layout that enables the user to focus easily on the functions they want to use. To a beginner, the multiple options might seem confusing and disorienting at first, but there is a “Getting Started” option that is guaranteed to help every user get accustomed to the way the software works, and how the various options can be accessed. A total of 15 different templates is offered for the user to choose from. This may seem a small number, but the options for customization of the created collage are many. You can increase or decrease the width of the margins, resize and crop the selected images exactly as you prefer, add or remove shadow effects, and many other options. The software is easy to install and uninstall and comes in two versions, free and Pro. The free version is not a trial and offers quite a few editing filters, but leaves a watermark on the collage, but that should not be a problem especially if you’re using CollageIt informally. The Pro version is reliable and fast, but requires payment of course, yet it is not too expensive to consider. 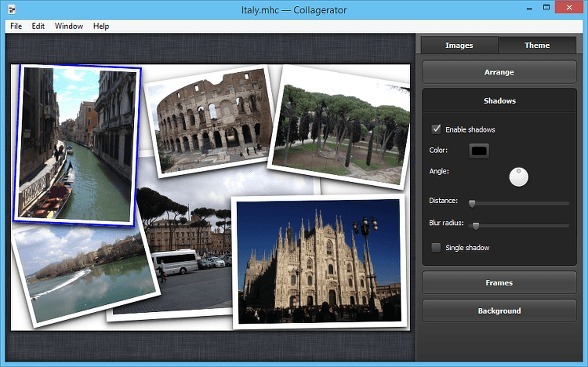 CollageIt functions fast without hitches and lags, but a lot of users find the free version rather limited and feel that it does not offer satisfactory options for cropping and layout definition. This collage making software is for all those people who like funny, out of the box backgrounds and frames for their collages. Funny Photo Maker lets you unleash your creative side- you can replace a famous person’s face by yours in a picture, insert your image on notes, billboards, magazine covers, etc. There are also a large variety of frames and beautiful effects for the user to choose from. The editing and collage making process is quite simple and fast as well. 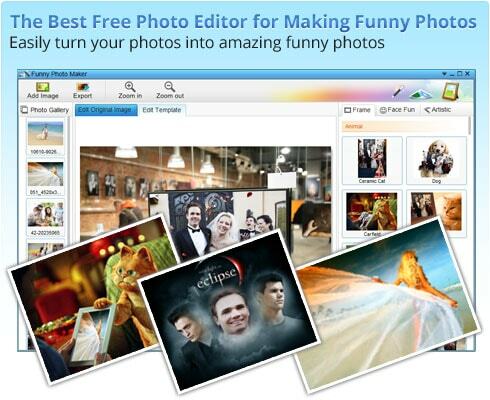 Funny Photo Maker is completely free of cost and does not require the download of any extra plugins to support it. What sets this software apart from a lot of other collage software out there is that despite being free, it is not interspersed with the frequent pop-ups and ads that one generally associates with free software. PhotoScape is a very well known popular image editing tool as well as an efficient collage making software. 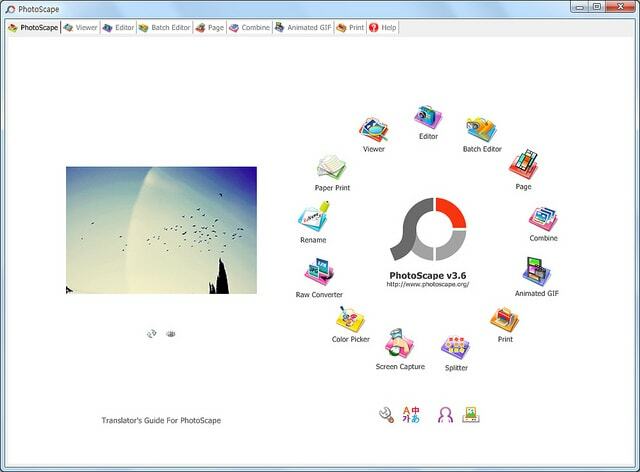 Though it looks very basic in its layout and interface, PhotoScape comes with a large number of detailed options. Precision is a key aspect of PhotoScape’s collage maker. 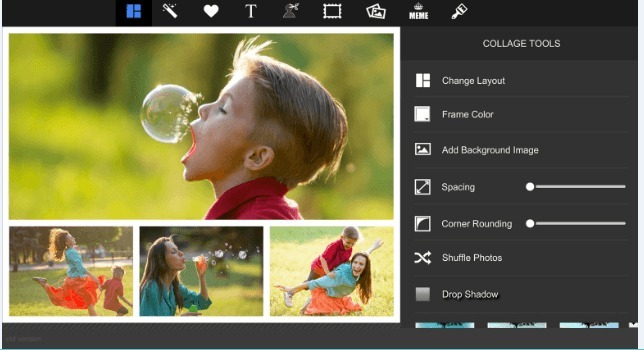 PhotoScape functions smoothly and offers easy adjustment of pictures, brightness, beautiful frames, text bubbles, and balloons, as well as allowing the user to add animated GIFs. However, superimposition is not supported and trying to work with layering pictures on PhotoScape can be quite tricky. piZap comes in a free version, as well as pro, but most users are satisfied with the free version and the options it offers. piZap is highly creative when it comes to the collage making tools it provides, you can add captions, text wherever you want, change the font and color of the text, add cute stickers and even add cool memes. piZap comes with a special crop tool that you can crop faces with, which is not a feature you’ll come across with most other collage software out there. There are a large number of effects and filters of every type you can imagine, frames and unique shapes for you to create a beautiful collage out of. piZap pays attention to the most minute details of editing and collage making- there are options where you can choose the degree to which you want the edges of your collage pictures rounded or sharp; how much space you want in between the pictures, etc. You can even use piZap to create your own Facebook covers and custom designed emoticons! This one’s a must try for those who love everything quirky and colourful! Picasa is perhaps one of the best-known and most widely used photo editing and collage making software for all those who enjoy editing pictures. Picasa automatically has access to any images you download to your computer; transfer to the system via USB flash drives, and pictures you may have taken from your webcam. All you have to do is import these images to the Picasa library, and then select the images you want to edit or make a collage out of. To create a collage, you just have to go to the Create menu and select Picture Collage from there. You can choose from a vast array of effects, and even add tags in order to keep your collages in order and classify them. Since Picasa has been developed by Google, a lot of users tend to gravitate towards it and trust it more than any other software. One flaw of Picasa is that it is, despite constant updates and newer versions, not good at facial recognition. If you are creating collages with the same people in it time and again, Picasa may still have trouble recognizing someone you’ve already tagged and asked Picasa to remember, and this can be a major cause of irritation. Nevertheless, Picasa is free, trustworthy and remains the most popular free editing and collage software. Thanks for sharing top app list for college photo making.. Really i enjoyed these. Awesome photo college software you have shared. Got some new Software name that I don’t use that before. Fotor is the best for the photo college.